Our First House. Built in 1969. We bought it on June 2012, and have been working on it since. Here's the listing picture...Sorry for the blurriness. This is the day we got the keys! We were excited, and had no idea what we were in for! Our house now is still in progress. We painted the door red, and the side paneling white. It makes the front look like it has a door instead of giant wood door. We also painted the shutters navy blue. And we adding a few more plants, but we plan on added more sometime soon too. We still want to get a nice side table, just make it more cozy! This was our front porch area. Do you see what I mean that our front door looked enormous? This is a picture of when we sort of did a few things though. We didn't have address numbers before, and we also didn't have the rug, or planter, but you get the idea. Not much has changed, expect paint color. I love my red door. I think we are the only house on the block with a painted door! We have a lot of things we still need to do to our front porch. We are still in progress for sure! This picture was the first couple days of getting the keys. 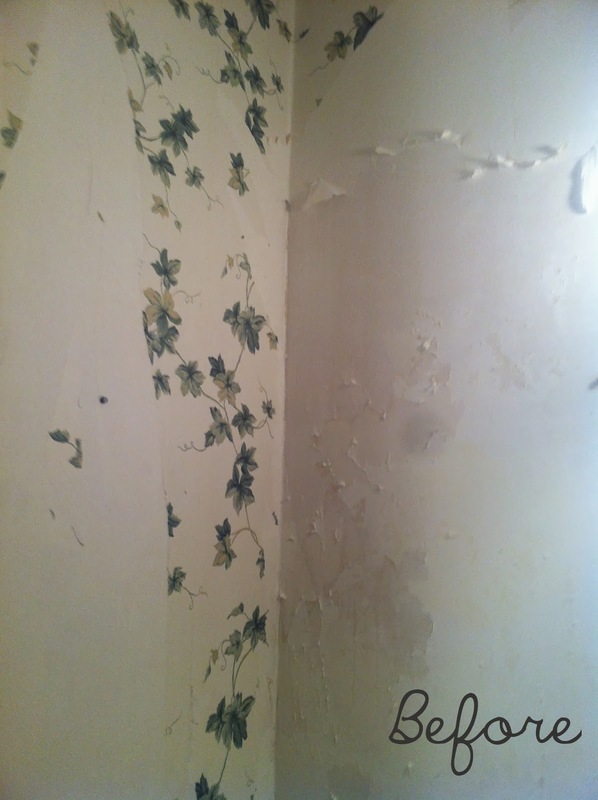 We were ambitious, and thought the wallpaper would be easy to tackle...so wrong! This is our foyer and the first thing people saw so we were determined. It took us about a month to finally finish getting the wallpaper off, and painted. This is our foyer now. A lot lighter, and cooler in color. The room is a light grey, and has black and yellow accents. Listing Picture of the entrance of the house. 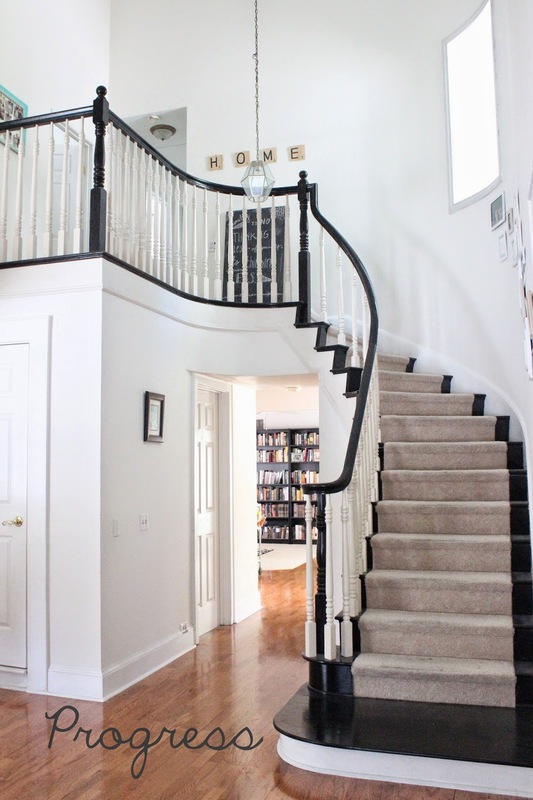 You can see the foyer, living space, dining area, and stairs. All the darker paint made the space look smaller. We went with an all white living space. 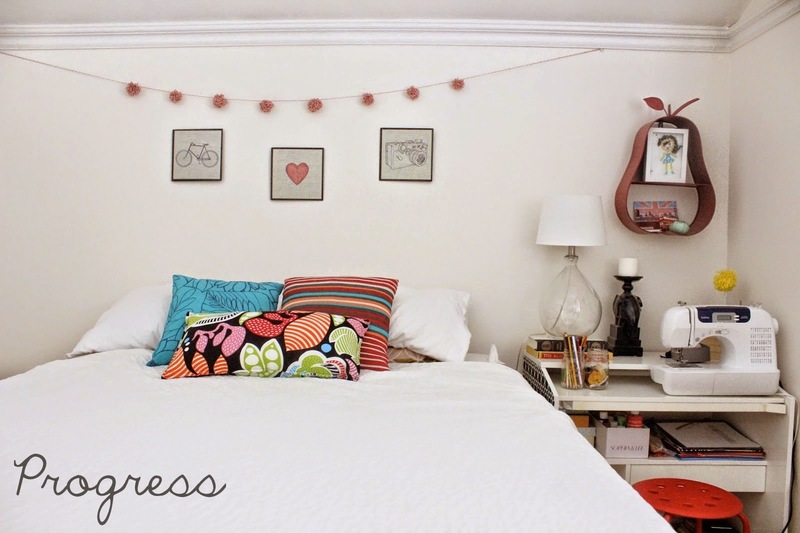 Not so gutsy, but I like decorating with color! Here is another terrible listing picture. And our stair way with green carpet, and brown walls. And here are the stairs currently. The carpet is now neutral, and I sanded and stained the wood a nice ebony color! This is the den/back room. 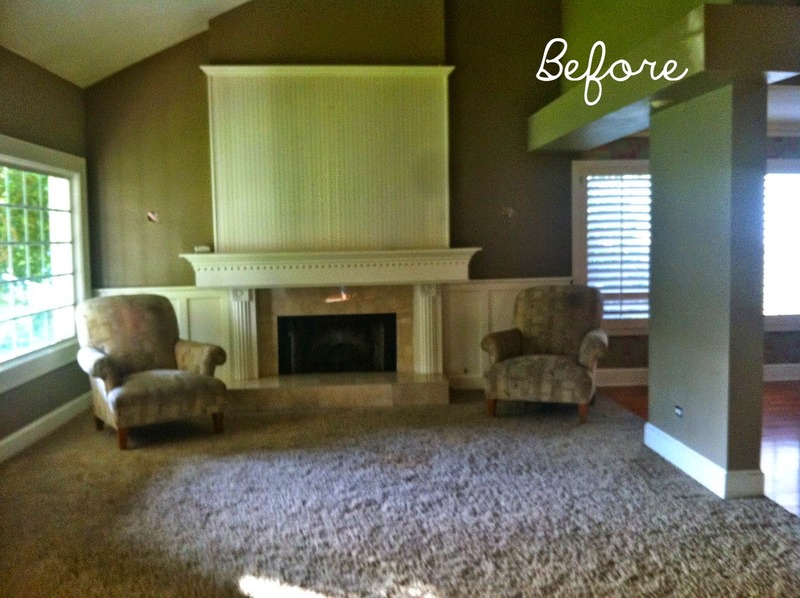 This room was just so dark, and that green carpet had to go! We turned the back room into a library. As you can see in the before picture, there was no window on the wall to the left, and now there is. Actually, the window was there already but they walled up right in front of it so all we had to do is knock the a piece of the wall down. 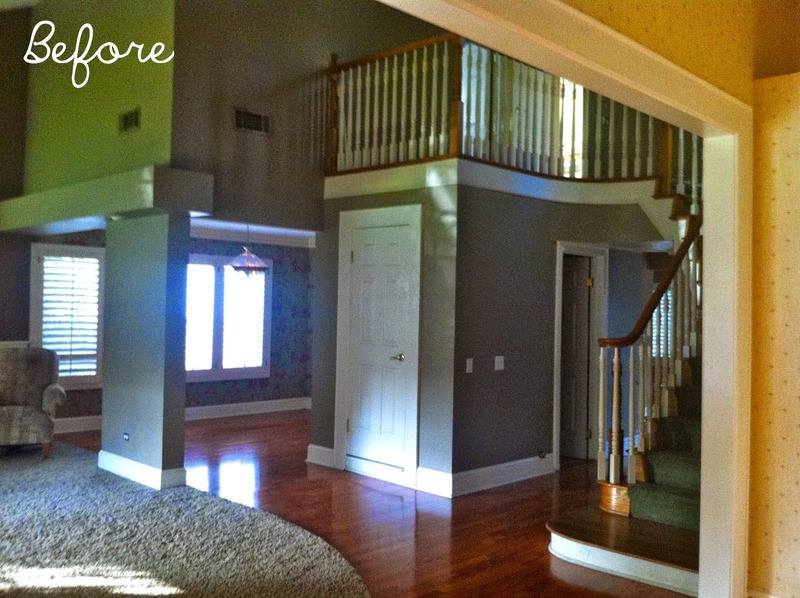 I also painted the room, and changed the carpet. We still need a couple more things in here. (and we also plan to possibly expand our kitchen into this room) As for now though, this is one of my favorite rooms. This is another listing picture. This room is our office. It really did look that awful. I didn't hate the built -in, but it wasn't necessrly my favorite. This is our office now. I painted the built-ins a nice crisp white. 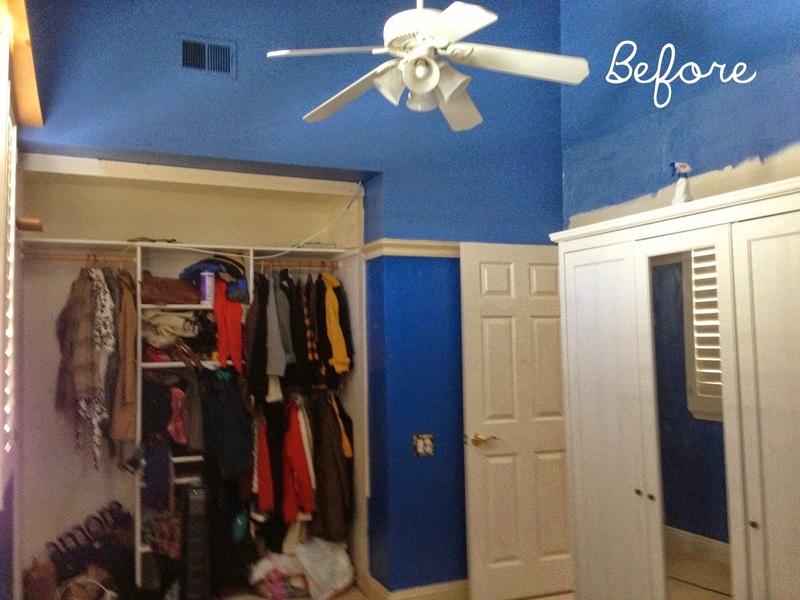 This room isn't huge so doing light colors made the room feel bigger. I also painted the back of the top shelves a deep navy/jade color blue. I also spray painted our old office chair a fun silver color. This room isn't complete yet, but all the fun colors do make me happy. This was our guest half bathroom downstairs. This bathroom stayed in this condition for months! That wallpaper seemed like it was eating you up. Here's our bathroom now. Definitely more inviting, and not as creepy! 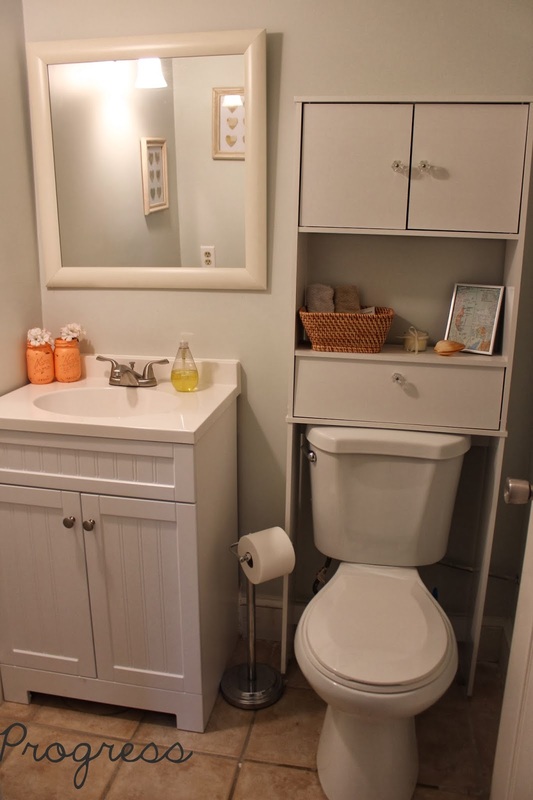 We changed the vanity, toilet, and added storage over the toilet. Not sure if the storage will stay there, but for now it works. And I eventually want to change the mirror too! Here's a closer look of the "wonderful" wallpaper. You can also see the damage the wallpaper did to the wall. Pieces of plaster were coming off, and we had to get it re-plastered! And here's a a closer look of the wall! Nice and smooth, and grey. The french doors lead to the office. It's right in front of a little nook. Also, the open door actually leads to a guest house (which is our income property) and is now a wall. The french doors to the office are to the right. (you can kind of see the hinges) You can also see that we walled up the area where the door was. We need to finish the base board where the door was. Still have that to do. The window was already there, and also need to find a cushion for our bench. Oh, and that's the fabric chandelier I made here for The Girls With Glasses Show. Our dining room. Good ol' green and pink victorian wallpaper. Not sure what to think of this room before. And yes, we lived with this wallpaper for months! We had so much wallpaper everywhere that I just was overwhelmed. It took me a while to finally get rid of it. 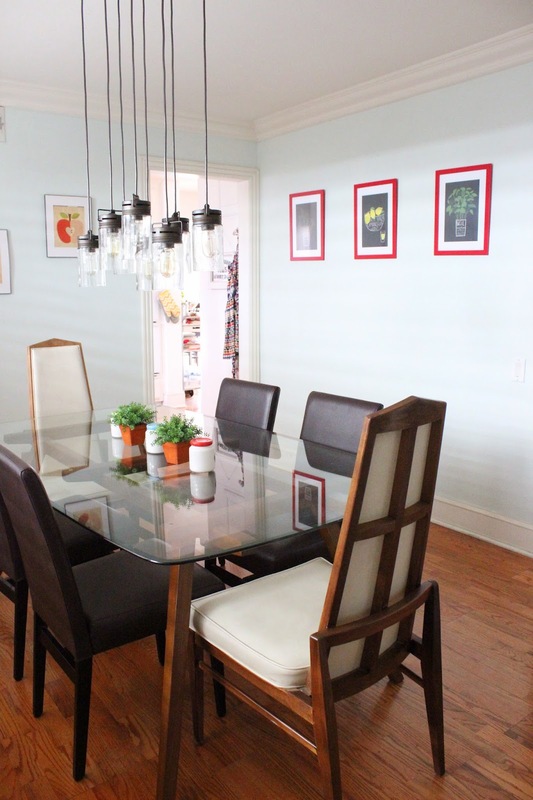 And here is our brighter dining room. The color is more of light blue/green/grey color. I needed something that made the room not feel claustrophobic. And from another angle. I want to do more with the decor. Just need to really focus on that room. But hey, it's better than the victorian mess. Our entry space that looks into our living room. Our old shaggy carpet that smelled like dog urine, and disgusting seats they left for us. And our living space now. We changed the carpet. 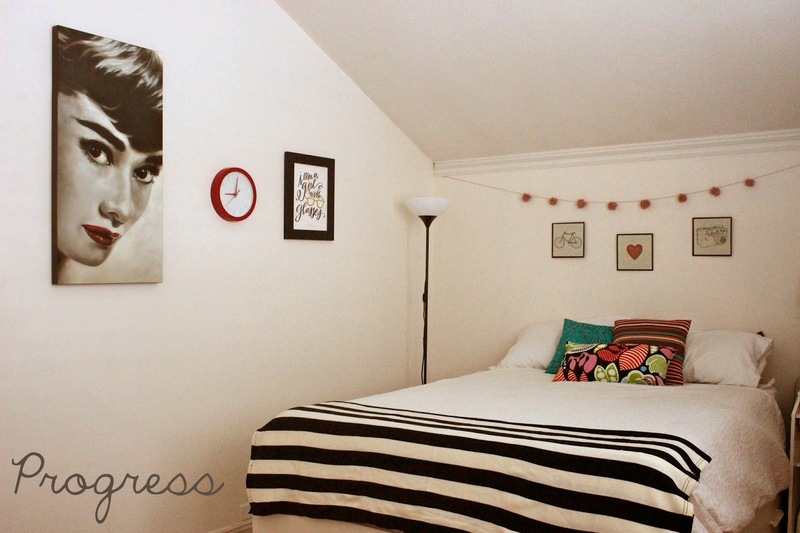 Painted the walls white, and hopefully brightened up the space. 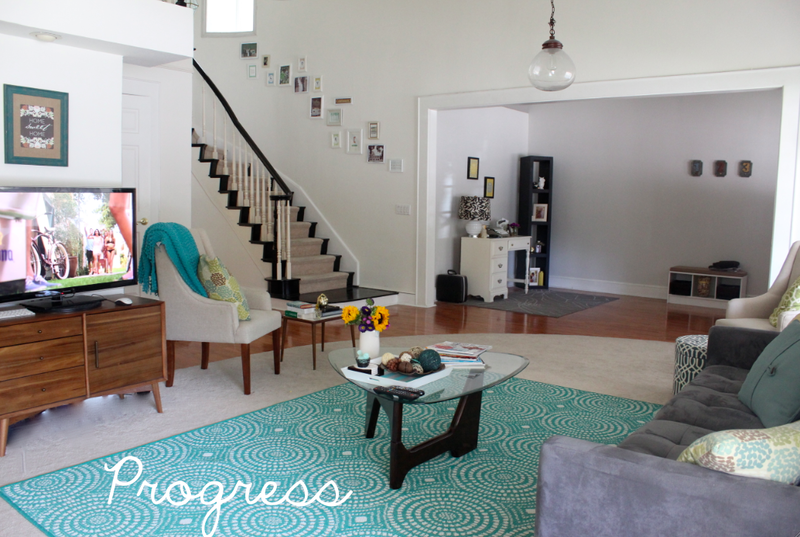 Ideally, we would want all wood flooring, but hopefully soon. For now this works. Here is our guest room. 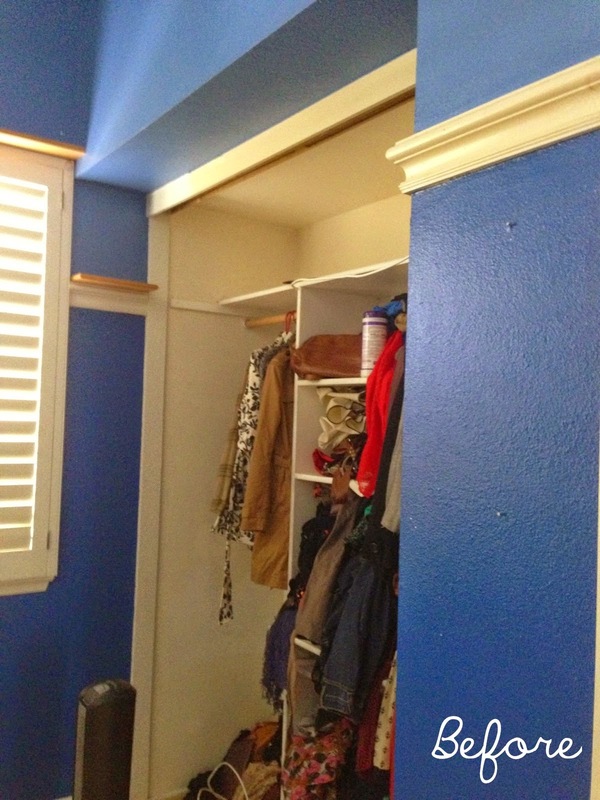 Bright blue, and no closet door. Oh, yeah. It was two shades of blue, and a large cityscape wallpaper covering a whole wall. Sorry I didn't ever get a picture of it. And here's our guest room now. 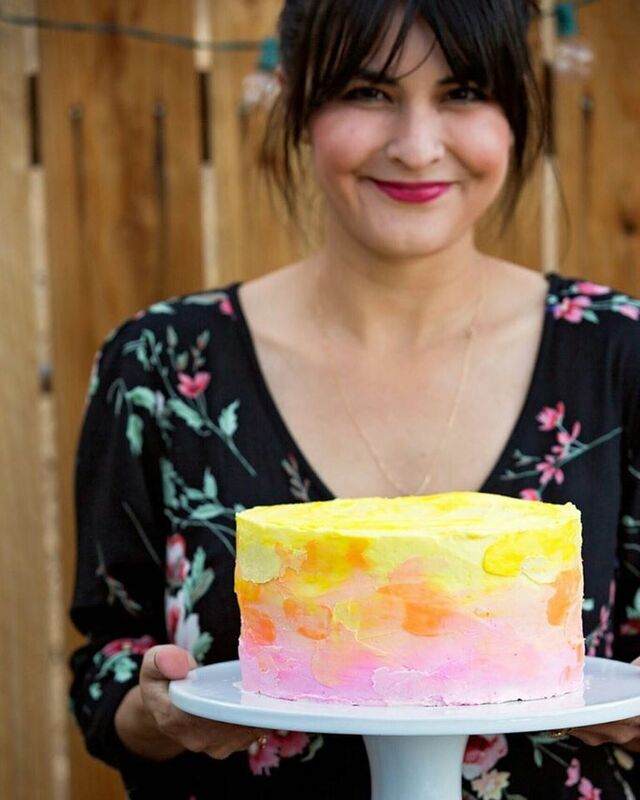 It is meant to be brighter with pops of more vibrant colors. I very much like the look of it now. 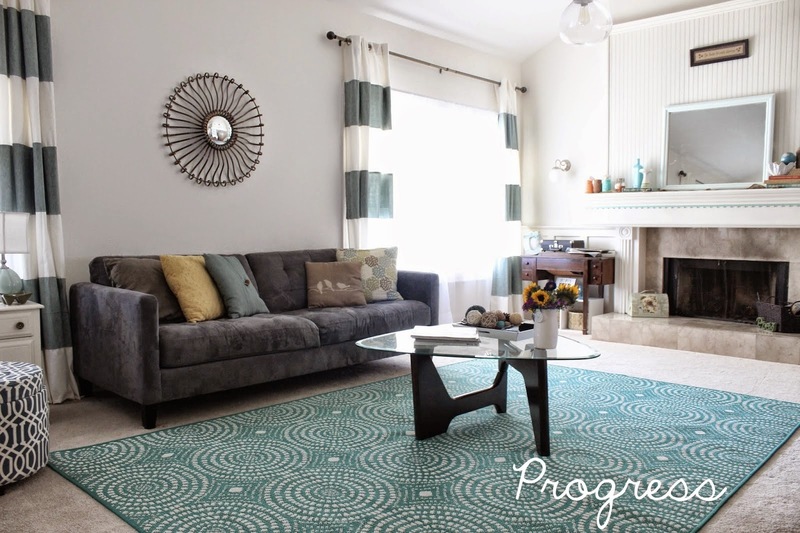 I hope to get a new rug in here. But for now, I love this room for our guest. I love your house, keep up the great job. I can't wait for you to help me with my own house! wow wow wowo!!!!! Looks amazing....great work changs! wow, muy bonito. Cuando tenga mi casa te pediré consejos, Felicidades ! Tu primo Miguel. I love the updates, such a beautiful job.